Before Kona, there was a lot of speculation about Caroline Steffen’s prep which included a full Ironman-distance race just six weeks before Kona. Now that the race is over, I have a closer look at some of the data on the impact of season planning for performance in Kona. There are not too many data points – after all, we only had 85 pro athletes on the start line in Kona. Each athlete recovers at a different rate, the analysis can only be a general guideline that has to be adapted for each athlete. My data and analysis is limited to the Pros, the picture could be different for age groupers. With these caveats out of the way, let’s have a look at the data. 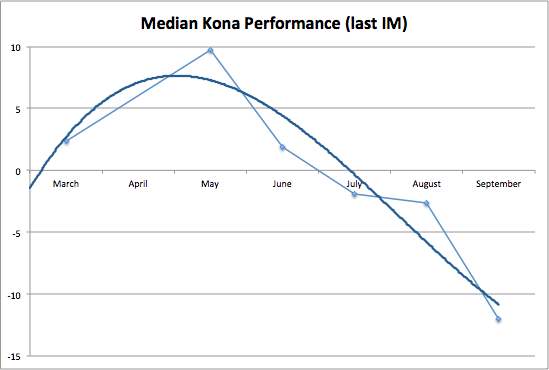 I’ll be showing graphs of athletes Kona performance. The Kona performance is the time difference (in minutes) between their Rating (based on all their previous results) and their normalized Kona finish time, after accounting for the course and conditions on race day. A „normal“ day would produce a Kona performance of 0, performances larger than 0 mean that the athlete performed better than expected, negative numbers indicate that things didn’t go quite as well. 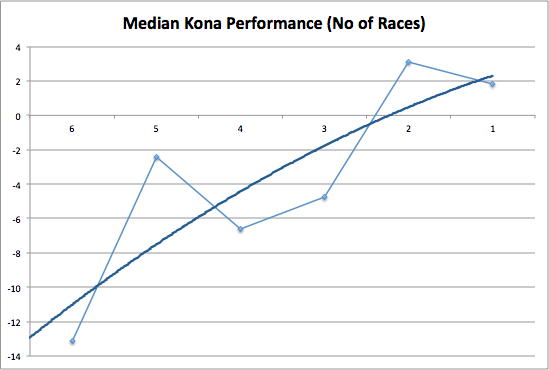 The month names indicate when the last IM-distance race was, the light blue line shows the median Kona performances, and the thicker blue line a „best fit“ for the data. The time since the last IM does not seem to have a discernible influence on the DNF rate. After May, the less time there is before Kona, the more likely it is to have a bad result. The 2013 data doesn’t show much of a difference between July and August. I’ve posted a similar analysis in 2011, with very similar observations. 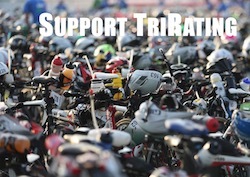 The more IM races you race, the more you’ll probably struggle in Kona. The ideal number of long distance races (outside of Kona) seems to be either one or two. Make a decision whether to focus on Kona or one of the European and North American championships (Frankfurt in July, Mont Tremblant in August). As far as I know, with the exception of Chrissie Wellington we’ve never had the same athlete win both in Frankfurt and Kona. Unfortunately, this is a bit in conflict with the way WTC has set up the KPR system – late season big races, and the hectic August qualifying. In my opinion, this is not the best way to set up athletes for great Kona performances.